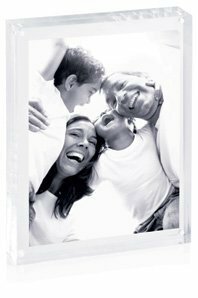 This beautiful acrylic photo frame has been a consistent best selling promotional item for over 10 years. Consisting of two slabs of acrylic held firm by magnets in each corner. It is a sleek, modern self supporting design; no additional stands are required. To install a photo simply separate the two halves, put the photo in place and then allow the two halves to snap back together again - it's that easy! They can be placed portrait or landscape and with a couple of pieces of double sided tape installed on one side you can turn them into wall frames. They are a beautiful retail quality product that is sure to look great in both the office and home environment so your logo is sure to get plenty of exposure.